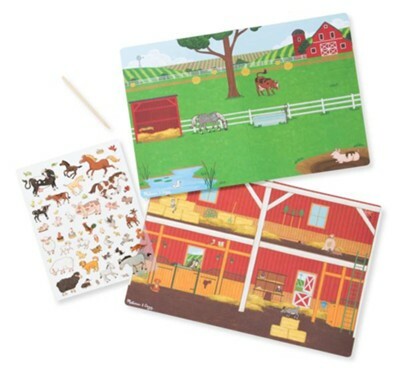 Get creative with the Transfer Sticker Scenes Around the Farm play set from Melissa & Doug. Designed for ages 4 years and older, this play set allows kids to bring the farm to life by rubbing dozens of stickers onto two illustrated scenes. Just position the stickers, use the included stylus to rub, and then peel back to reveal art that blends right in with the scenes. A fun and engaging way for kids to develop fine motor skills, learn about cause and effect relationships and to hone narrative thinking skills. Measures 11.5" x 8.5". I'm the author/artist and I want to review Around the Farm, Transfer Sticker Set.